An "epiphany" is a sudden manifestation or revelation of something. 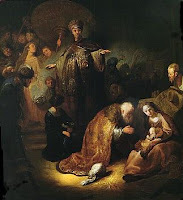 When we speak of the "Epiphany of the Lord" we mean the moments when the Son of God was revealed to mankind. On this day, our thoughts are naturally drawn to the revelation of the Christ Child to the Three Wise Men. What a sight it must have been! Jesus was surely a child of indescribable beauty and splendor. Note that, by being born of Mary and of the line of David, he comes to the Jews. In his appearing to the Magi, he comes to the Gentiles. And thus, he is revealed to the whole world. When Jesus was baptized by John in the Jordan River, a dove (symbol of the Holy Spirit) rested upon Him and a voice cried out from heaven: “This is my beloved Son, in whom I am well pleased.” Even before the baptism, John cried out, “Behold, the Lamb of God who takes away the sins of the world.” Set your eyes upon Him! Jesus is the anointed Son of God and Savior of the world. The wedding at Cana is the context for another epiphany in that it is here where Jesus performed his first miracle, turning water into wine. The gospel writer says of this miracle: “This, the first of his signs, Jesus did at Cana in Galilee, and manifested his glory; and his disciples believed in him” (Jn 2:11). His glory was manifested on that day, a true epiphany. Yet, is He not also revealed to us in the Mass? Does not the priest, after the consecration of the Eucharist, repeat the very same words as John the Baptist? “Behold the Lamb of God, behold him who takes away the sins of the world! Blessed are those called to the supper of the Lamb!” I suggest to you that this moment too is an epiphany. Just as the divinity of the Lord was in a way veiled by his humanity, so too our Eucharistic Lord is veiled, hiding behind the species of bread and wine. Yet, we know by faith that He is there, just as the Magi knew that this little child, born in a manger, was the long-awaited Messiah, just as John the Baptist knew as soon as he set eyes on Jesus that He was the Lamb of God who’s Precious Blood would wash away our sins -- and more important still -- just as Mary knew that she could ask anything of this Man and it would be done. Set to John Stainer's arrangement of the traditional tune "Greensleeves". Sung by The Choir of King's College, Cambridge, 1995. I keep having 'epiphanies' everyday for the last 4 years since becoming a "practicing Catholic" in heart/mind/soul! I LOVE the Church Jesus founded and gave us to keep us safe.